Sites of encounter with dolphins: are they Embassies? Should humans honour the choices they make, if they do? The border, the meeting, the choice: whose choice is honoured? In the language of academia, choices intentionally made are sometimes defined as an expression of 'agency'. In this article I discuss dolphin agency and how humans respond to it, and announce the publication of a scholarly article that includes a suggested way to understand and respond to interspecies encounter opportunities. In locations around the world, from ancient times to the present, dolphins, for their own reasons, have sought out human contact. Some do so today in cooperative fishing ventures, where dolphins herd fish toward places where human fishermen stand, waiting with nets. Fish are caught in the nets, gathered up, and some let go for the dolphins to feed on. In the estuary at the mouth of the river Plata, in South America, this has been going on as long as anyone remembers. The Imragen people along the west coast of Northern Africa do the same along an ocean beach, aided by dolphins who drive fish to shore. Australian aboriginal tribes tell of many sites where dolphins drove fish inshore to be caught by humans: on Bribie Island; just north of Coffs Harbour; and at Amity Point on Stradbroke Island, among others. And then there are the places where dolphins come for another reason: to communicate and to play. Some of these situations last only a few days or weeks, with local people enjoying a brief series of encounters. Some get more well known, lasting weeks, or months. And some, like Fungie, a dolphin who lives just outside Dingle harbour in Ireland, stay for decades--since 1984. Fungie has been visiting the harbour there for nearly 30 years now. He has been known to have a female friend for several seasons who leaves him behind, to live alone again. 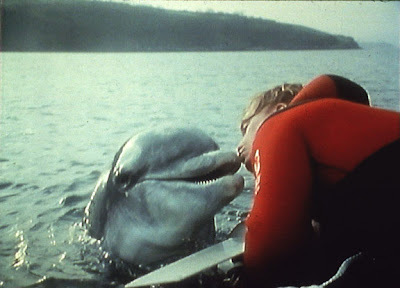 His antics with divers and swimmers are legendary, having inspired films, books, healers, mystics, and activists. 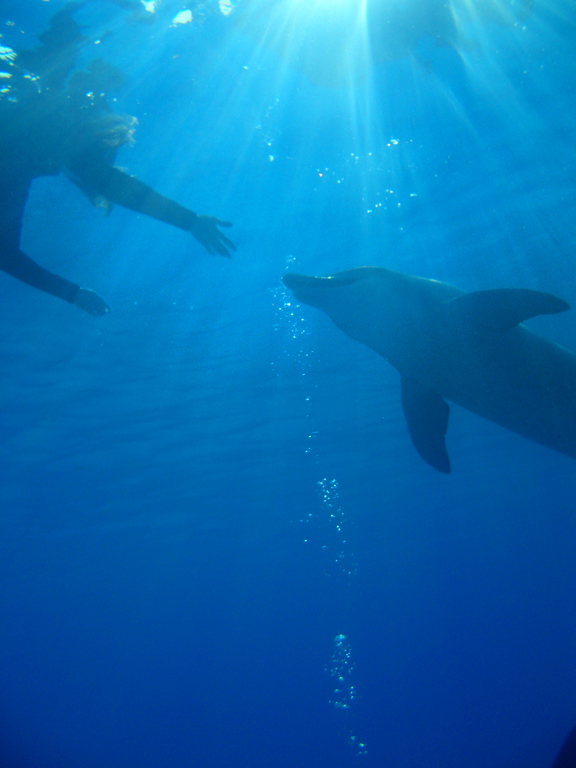 Another site where dolphins have interacted with humans for decades in Kealakekua Bay, on the Big Island of Hawaii. Here Spinner Dolphins have come daily for rest, socialising, and human interaction. Numerous scientific studies have been done at K Bay, beginning with those of Dr Ken Norris, who published two books about his research there and elsewhere (The Porpoise Watcher, 1974; Dolphin Days, 1991). A well-known dolphin interaction advocate and swim-experience leader (Joan Ocean) has lived aside K Bay for decades, writing books (Dolphin Connection, 1989; Dolphins into the Future, 1997), leading workshops, and producing various films. Terry J Walker, who wrote "How to swim with Dolphins" (1998), has lived in Hawaii most of her life, and began swimming with the K Bay dolphins in the early 90s, and has tirelessly worked to help humans understand and appreciate the dolphins there so that the interaction can continue. Kealakekua Bay is the place where I was first drawn into the real-world challenge of dolphin-human interaction as an issue of dolphin choice versus human concerns. Humans, rightly so, have been making an effort there to avoid the problems that have arisen elsewhere, where dolphins have chosen to befriend humans. Research has shown that all-too-often these encounter sites become places of sorrow, where the dolphins suffer for their friendliness (see "Lone Rangers: a report on solitary dolphins and whales including recommendations for their protection", a report for the Marine Connection, by Goodwin and Dodds, 2008). Altho it cannot be said this always happens (see Fungie, the dolphins who visit Monkey Mia, Tangalooma and Tin Can Bay in Australia, and the Atlantic Spotted dolphins living in the waters near Bimini, as examples), there is a sad pattern to be found: the dolphins come, humans interact and all is well, then humans act inappropriately, some official entity passes restrictive rules, some humans get angry, and the dolphin is either driven away, injured, or killed. No one wants this to happen. Efforts to understand and control these situations, with the aim of protecting the dolphins from harm, have been put in place. However, in some cases, these very rules have led to poor outcomes. Threatening signs posted on beaches, arrests for 'harassing dolphins', and huge fines for innocent interspecies play have ensued at various times. 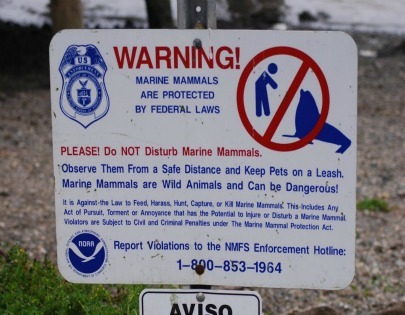 "civil and criminal penalties" for interacting with marine mammals. One of my interests has become this issue: how to accommodate the very fulfilling, educational, stimulating, and for some, spiritually inspiring, experience of interaction with free-ranging dolphins in ways that are safe for both dolphins and humans. To this end, I conducted a research project under the auspices of the University of the Sunshine Coast toward fulfilling the requirements for my Bachelor's Degree in Geography, under the title "The Dolphin-Human Connection: Embassy or Zoo-without-walls?". I earned a first class Honours degree for this research, which analysed various dolphin-human interaction management schemes. Based on that research, I wrote (with the assistance of Dr Jen Carter) an article for the peer-reviewed journal Geographical Research, which has now been published. The Agency of Dolphins article explores the question of choice, the intentional volition of dolphins as they come into contact with humans for their own reasons. It concludes that dolphins do have agency -- and that they make an intentional choice to approach humans-- in these situations, and that this choice deserves to be framed as one of respectful intercultural interaction. If dolphins, and many other animals who are in contact with humans, are often referred to as 'ambassadors' of their species, it seems a simple extension of this common idea to conceive of the sites where this occurs as embassies. An embassy, by common definition, is a place where different cultures come together in a spirit of respect, where cooperation is expected to negotiate ways of communicating that can lead to mutual satisfaction. An embassy implies an 'interspecies etiquette' (first suggested by Cheney and Weston in 1999), which is a considerate stance based on empathy, intended to "create the space within which a response can emerge or an exchange coevolve". This article is intended to open a dialog, to open an area of interspecies interaction research and subsequent legislation. It seeks to add another worldview, one that takes into account the choices of dolphins, who seem very willing, for reasons we cannot know, to befriend humans. It is up to humans to figure out how to manage human responses to these wonderful opportunities. Serious researchers can request copies of the article.